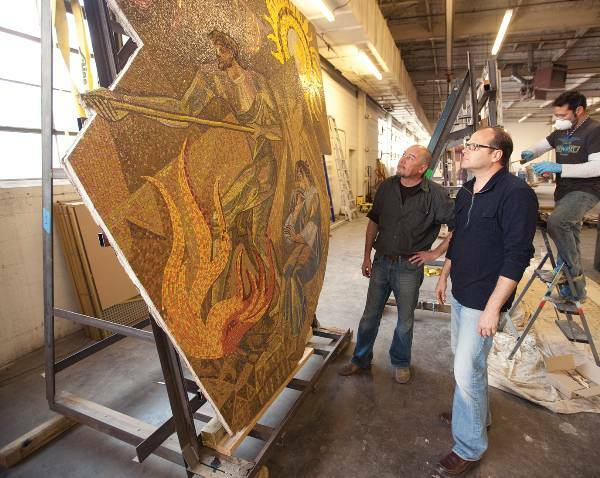 In Dallas, a mid-century Millard Sheets’ mosaic masterpiece is rescued. This article originally appeared in the March issue of Art & Antiques Magazine as “Tiles in Time”. Robert Lee Thornton’s ambition was perhaps only eclipsed by his adoration of Dallas. In 1916, the former greeting card salesman started a bank with $12,000 in capital and $6,000 borrowed. He was elected president of the Chamber of Commerce in 1936, then mayor in 1953. The man with an eighth-grade education served an eight-year term in charge of the city. “Mr. Dallas,” as he was known, guided an architectural reconstruction, and notable among his achievements was his own banking complex, downtown on Commerce Ave. Thornton’s complex huddled around the 31-story Mercantile Bank Tower, a Walter W. Ahlschlager design that was the tallest building west of the Mississippi when it opened in 1942. When Thornton conceived the Dallas Building annex, he commissioned the artist Millard Sheets, a master in marrying art and architecture, to aid in designing the building’s interior. Sheets, a Californian, gained recognition in the early 1930s as a watercolor painter but was deft off-canvas as well. In the 1950s, he had begun to design bank branches in Southern California. By doing so, he explored new media—mosaics, murals and sculpture—and wove them together with the buildings’ steel, brick and mortar bones. Sheets rejected the notion that a bank was simply a repository for money. His design creations combined an artist’s skillful hand with an architect’s keen eye for spatial construction, and perhaps none of his designs was as glorious or seamless as the Dallas Building in the Mercantile National Bank. “He felt that art and architecture walked hand in hand,” says Millard’s son, Tony, a sculptor and art restorer. “All of his buildings he designed with art elements that were integral to the building not just stuck on. They were built in as part of the design architecturally.” Unfortunately, the Dallas Building, which was completed in 1959, was taken down in 2006, but a set of mosaics Sheets created was salvaged and has just been restored. They will eventually be reinstalled in a Dallas hotel. Sheets assembled a troupe of over 20 artists to help decorate the Dallas Building. Albert Stewart sculpted panels from cast stone of horses stampeding as a flourish between the bank’s subterranean drive-through windows. Stanford Stevens painted watercolors and Harrison McIntosh, one of the many Californians recruited by Sheets, created ceramics displayed in the building. Sheets himself, collaborated with Los Angeles artist Susan Loutmann on a 10-by 27-foot oil painting called The Parable of Talent, which depicted the history of commerce and was displayed in the First Federal Savings and Loan bank, on the building’s first two floors. The grandest and in some ways most subtle elements adorning the building were the mosaics, composed of tesserae imported from Venice. Sheets’ office in Claremont, Calif., 30 miles east of Los Angeles, had a mosaic studio, and it was here, with help from Italian artisans, that precious stones and Venetian glass were set into the patterns that adorned much of the Dallas Building. Sheets had traveled to Europe to become familiar with mosaic design and production. 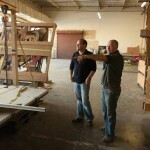 He admired the craft, his son says, but aimed to deploy it in accordance with contemporary principles. The mosaics throughout the building, collectively, were not one unified composition. But, in smaller groups, some told stories; for example, the four largest pieces, roughly 14 by 9 feet, had the four elements—Earth, Fire, Water and Air—as their theme. 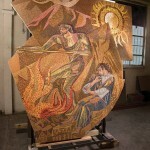 The Fire mosaic, shaped almost like a vase, depicts a burning golden sun in the right hand corner, a smoking volcano in the background. In the foreground, in front a rasping orange flames, sits a woman beside a long-limbed man who looks to be smelting ore. The mosaic epitomizes the grand scale of the work and the lavish employment of the technique. Other large two-sided mosaics depict the origins of local industry, and were set floor to ceiling to serve practically as dividers along the second floor. Some works, however, impressed with their nuance. In the penthouse apartment, a series of golden horses were placed into the wall by Sheets in a crossword pattern. Along a floor that contained offices, 13 birds, red, blue, brown and gold, took flight across a tan travertine wall. The carefully placed gold and red stars and mandala symbols floating in the stone around the mail drop were meant to be discovered, not to be obvious. Even the elevator cabs were embroidered with intricate mosaic work outlining symbols of local corporations that helped grow the bank’s wealth. But this monument to Art Deco’s heyday has had a fitful history. The owner of the Mercantile complex, MCorp, filed for Chapter 7 bankruptcy in 1989, as the savings and loan crisis swept across the country. The Dallas Building was vacant by 1993, and a once bustling civic institution and window into art and architectural history was shuttered. When Forest City Enterprises, a Cleveland firm, was awarded $70 million by the city of Dallas to develop the site in the spirit of urban renewal, the Dallas Building was to be demolished. As the building fell into disrepair and was eventually abandoned, and so was much of the art. The ceramics, a tapestry by Sheets and much of the sculpture was lost or sold. Firsching said a liquidation sale occurred in the 1990s, and pieces were dispersed by the semi-trailer-load via a blind auction. The mosaics, though, remained. They were too cumbersome to move, and many were set into the travertine walls. Like the ancient mosaics among the ruins of Pompeii, the Sheets mosaics were stranded. “What’s interesting to me about the collection is how extensive and dramatic and fine it was, and how utterly forgotten it was,” Firsching says. Those who did not forget acted swiftly to save the mosaics. A local councilwoman, Angela Hunt, pointed out the wicked irony that the city was paying a company to destroy its own historic artwork. She assembled a team of advocates that included Firsching and Craig Melde from the Architexas firm and conservator Michael van Enter, all of whom were enamored of the craftsmanship and uniqueness of the mosaics and developed a plan to remove them. 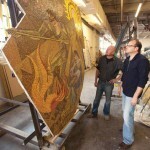 In 2006, as advocates staved off demolition, oil baron and art collector Tim Headington decided to take the mosaics, paying a quarter of a million dollars to remove work valued between $2 and $3 million. Van Enter decided that the work could be taken from the building, though it would have to be removed by hand, “carefully, methodically, almost archaeologically.” Still, he was unsure exactly how the pieces were mounted to the wall and whether or not they would crumble as the surrounding travertine was chipped away. Like Sheets did years earlier when the mosaics were made, van Enter assembled a team of technicians—this time to reverse the installation process. 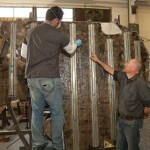 As pieces of the building were being demolished around them, the technicians glued each panel to a metal frame that could support the mosaic once the wall was chipped away, and then be used to transport the mosaic. Thanks to this technique, all 93 mosaics were removed from the site intact within three months. Since late 2011, van Enter has been in the process of reinforcing the back of each work with fiberglass, resins and steel. He then re-mounts them on a steel frame—similar to those used to remove the works from the building—that houses each mosaic and makes them mobile and capable of hanging on a wall again. “Headington is invested in making sure this sort of thing never happens again,” van Enter says. The mosaics will eventually be placed in The Joule, Headington’s downtown Dallas hotel, finding a new home and new context in another historic building. Their former home, the Dallas Building, is gone, replaced by a swimming pool, but the waters of time are unlike to wash over these impressive relics of mid-century art again.